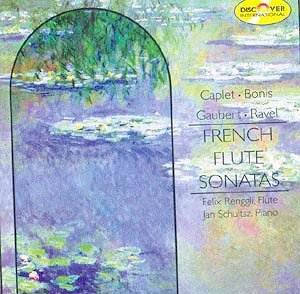 Ravel, Bonis, Caplet & Gaubert Flute Sonatas etc Felix Renggli (flute) Jan Schultsz (piano) Discover International DICD 920492 62' 37"
This is a pleasing collection of French flute music from 1897 (Ravel's student sonata) through the first half of the 20th Century (Gaubert lived from 1879 to 1941, but his third sonata here is not dated). It is all elegant, idiomatic flute music, typically French, and maybe a little cool. Felix Renggli is a Swiss flautist, pupil of the marvellous Aurele Nicolet, thoroughly reliable, with a smooth, unruffled tone. He has numerous CDs to his credit. The early Ravel sonata is clearly influenced by Franck & Faure but a charming concert piece in its own right, well worth reviving. Andre Caplet was a teacher and friend of Debussy and orchestrated some of his scores. His songs on Unicorn-Kanchana DKP 9142 (nla) are delectable and well worth seeking out. Philippe Gaubert is described as 'father of the French flute school' and was a prolific composer, also principal conductor at the Paris Opera. For me, the discovery here is Melanie Bonis (b. 1858) who - like Elisabeth Lutyens and many other women composers - interrupted her career to concentrate on bringing up a family, and only returned to composition from about 1900. Her sonata (1901) is nicely balanced between tradition and openness to impressionism, light and radiant - worth any flautist's attention. Clean, clear playing and recording. A valuable exploration of forgotten music from the recent past. Adequate notes, though print is very small.